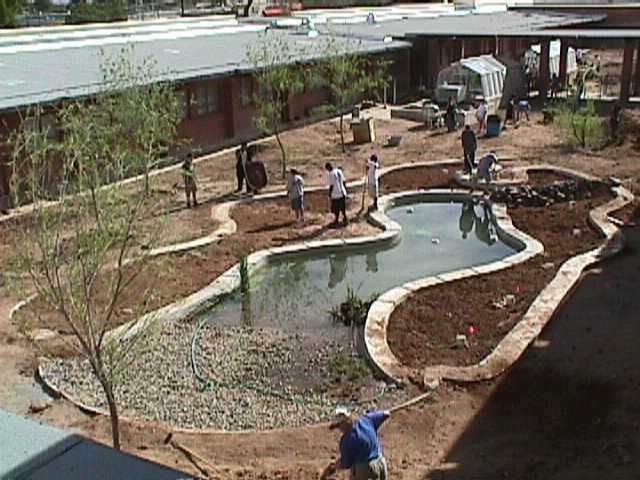 Palo Verde High School is a Tucson city school with little native habitat close enough for students to visit and interact with during school hours. 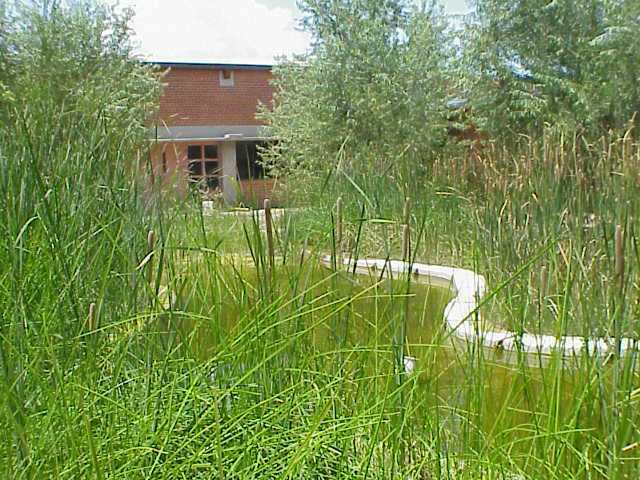 Realizing this, students and faculty constructed a wetland habitat that is representative of those wetlands once commonly found throughout Arizona's Santa Cruz River Basin, in which the city of Tucson lies. Now nearly three years later, the wetland, named Tierra Mojada Environmental Research Center or TMERC, teems with native flora and fauna native to the Santa Cruz River basin. 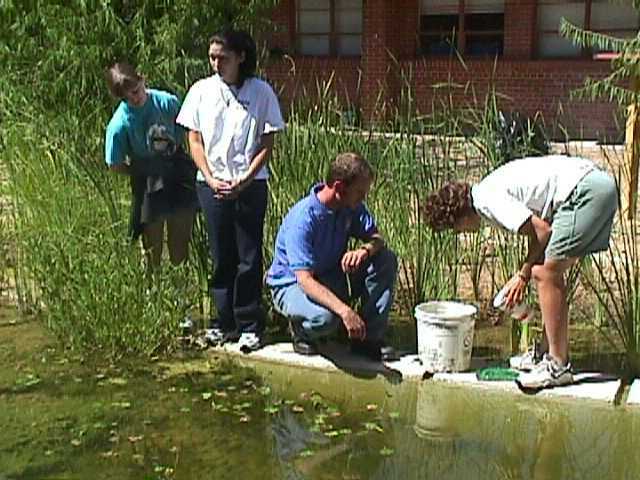 For their efforts to further education in native fishes conservation, Palo Verde High School is a recipient of the 2001 Gerald C. Corcoran Education Grant. To learn all about it, read their grant proposal in pdf format HERE. Below are some photos to accompany the proposal. 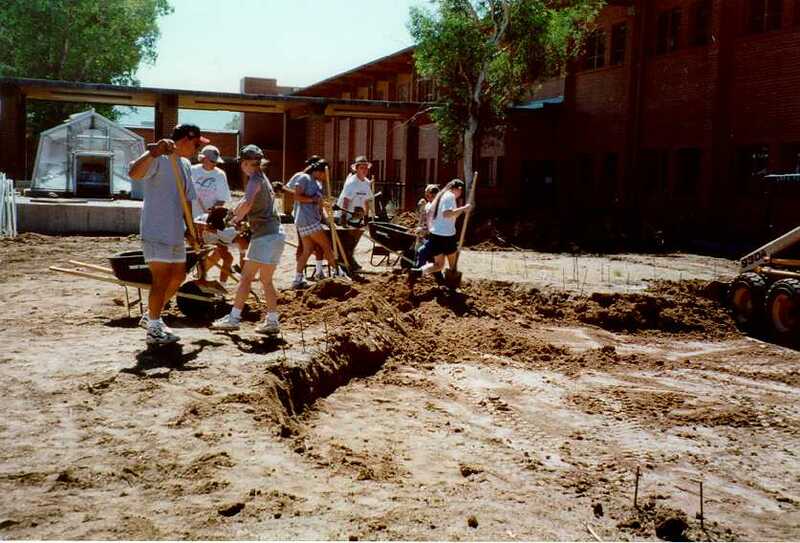 Students digging the big hole during the hot Tucson summer (June 1998). How the wetland has grown and filled in (September 2000). All plants and fish were collected with permission from Cienega Creek, an intermittent stream fed by springs and snowmelt. 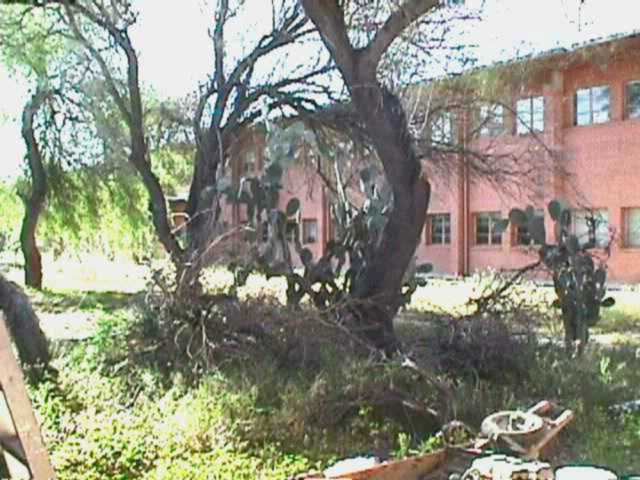 The vegetation consists of plants native to southern Arizona wetlands. Emergent vegetation includes cattails (Typha), horsetails (Equisetum), bur marigolds (Bidens), speedwell (Veronica), watercress, and various sedges and rushes. The aquatic vegetation is limited and has yet to be identified. It grows low, about eight to twelve inches. This leaves plenty of clear, open water for fish observation. Of particular interest are the natives fishes, which were obtained by permit through the Arizona Game and Fish Department. Four species now reside in the 16,000-gallon habitat-- longfin dace (Agosia chrysogaster), Gila chub (Gila intermidia), desert pupfish (Cyprinodon macularius macularius), and Gila topminnow (Poeciliopsis occidentalis occidentalis). The latter two species are both federally listed endangered species, their dwindling populations due to loss of suitable habitat and competition with non-native species. Not only is TMERC a holding facility for these fish, but the wetland is also a designated refugium ready to support other populations in the near future. The release of the desert pupfish. The woman on the far right is Heidi Blasius, our AZ Game and Fish contact. About 50 desert pupfish were introduced almost two years ago. These have reproduced and approximately doubled their numbers, although exact numbers are hard to come by. It is easy to identify sexually mature males of this species since they become brilliant blue during that period. Pupfish fry have also been seen. Approximately 150 Gila topminnows were released shortly after the pupfish. These have also done very well and are reproducing. These males turn black when ready to mate and they have been seen vigorously pursuing the more dully-colored females. After an initial loss of stressed or weakened fish (~50 to 75) I estimate the topminnow population to be around 200. In addition we have longfin dace (~6 individuals) and Gila chub (~2 individuals) that were inadvertently collected and released with the others. Since all four species occur together in the wild, these were allowed to remain. This illustrates the clarity of the water and the ease with which the fish can be observed. 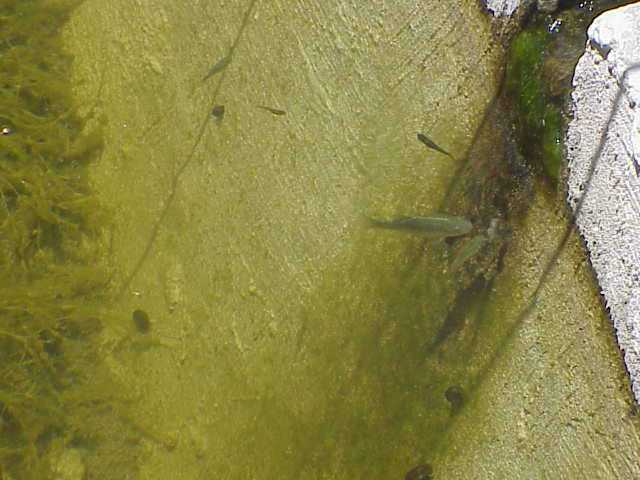 Pictured is one dace (largest) and several gila topminnow. The bottom can be seen here and is at a depth of about three feet.